Hello everyone! 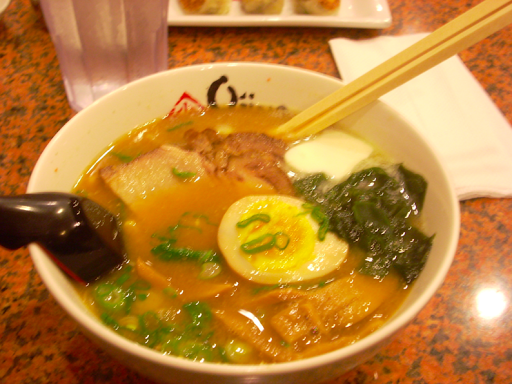 Tanya, my brother Mark and I had a ramen run this past Saturday evening (Feb 5th) at a little place called Ojiya. It’s located in Rowland Heights/ City of Industry. I say slash because this area gets really confusing. Apparently there are bunches of narrow cities next to each other, so you can be in one city from one block, then the next city in the next block. 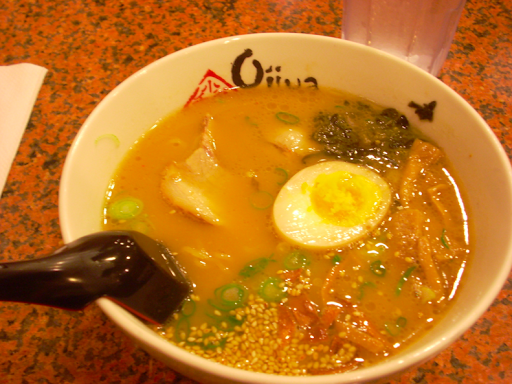 Weird… Anyway, we wanted to check out one more ramen house in the area, so we googled ramen and found Ojiya. When we walked up, there was a wait list outside, which had no one signed in. Like idiots, we didn’t bother looking inside and signed in. There were only 3 out of 15 or so tables taken. I got worried. We decided to just pop in and a server seated us immediately. The place was small, kinda cute. 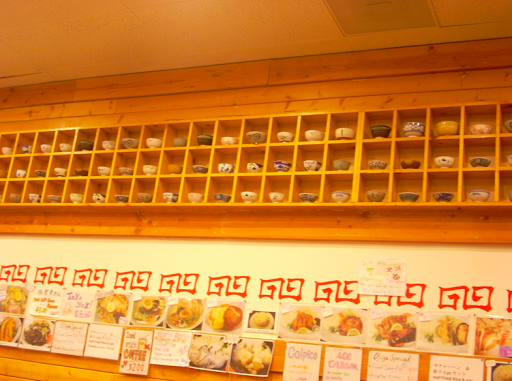 They had little shelves filled with hundreds of asian style bowls. I looked at the menu and damn. This place is pricey. All I kept thinking was that this place better be worth it. I ordered the tonkotsu ramen ($7.50), Tanya ordered the miso ramen ($7.50), but for some reason was given the miso ramen w/chasu and butter instead ($9.00) and Mark ordered the tonkotsu chasu ramen ($9.00) which I thought looked exactly like my ramen. I was disappointed with how small the bowls were, despite the high prices. 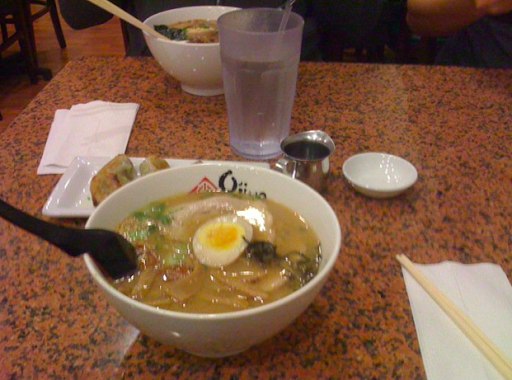 I have to say, the ramen was… okay. Usually a good bowl of ramen will put a big smile on my face and I’d be raving over how good it is with the first few bites, but no. I thought the ramen was alright. The broth was not as flavorful and very salty. I seriously felt swollen that night. The noodles tasted okay. The pork slices were okay. The only thing a little different is that they had roasted garlic bits in them which was pretty good. Overall, the ramen was okay. I don’t think I would recommend this place to anyone. Daikokuya and Ajisen are a few miles down the street and I would not mind the extra driving effort. What bothered me and I’m sure Tanya as well, was that Tanya ordered one thing and got something else instead. When the server tried to exchange it, whatever her conversation was with the chef… well the chef obviously had a fit over it. Tanya didn’t get what she ordered! Don’t worry, she got hers exchanged, but we didn’t get a chance to take a picture of it. Another thing that bothered me was that there was a curtain covering the kitchen. All the ramen houses I’ve been to so far, I can see the kitchen and who is working in them. All the servers at Ojiya were Japanese obviously, but in the kitchen, were… non-Japanese! 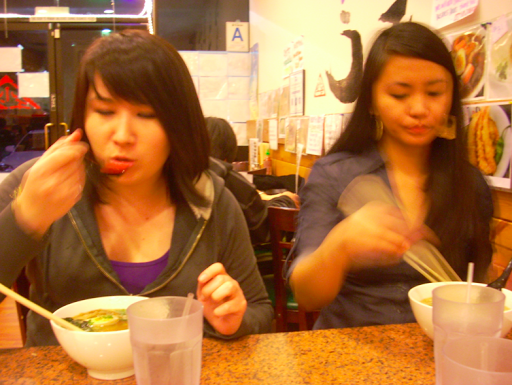 I believe they were not even Asian at all and no offense to them, but they just don’t make ramen the same. And what bothered me the most was that the server that gave Tanya the wrong ramen had a smile that looked exactly like one of my other best friend’s ex-girlfriend. She looked sneaky, like she was up to no good. Okay, enough of being bothered. I didn’t even want to bother with a cool title. Ojiya… exactly how I feel. After our quick ramen dinner, we stopped by the asian plaza that we always go to in Rowland Heights to pick up some candy. Is it just me… or do asians not like car colors other than black, white, and silver? The moment we drove down the structure, all the cars were something like that. 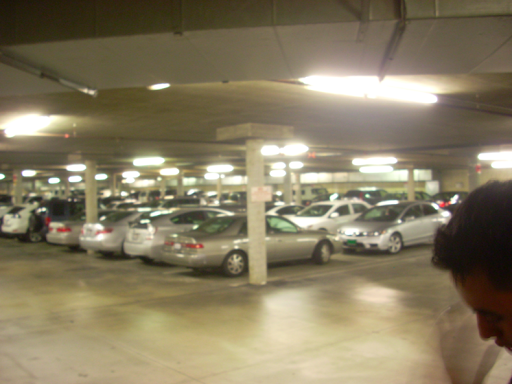 Usually in a parking lot I’ll see lots of red, some purple, yellow, or some other bright color. The most adventurous these asians would get is with a blue car. Wow. But I did see ONE red car in the entire parking lot. They probably weren’t asian. I don’t know, it freaked me out. But I shouldn’t be a hypocrite. Tanya drives a black Honda and I drive a white Nissan. But it wasn’t my choice, I swear! We still need to go to Orochon!